Chronic discomfort can be more than a pain in the neck. Neck pain can make it hard to move your entire body. It can prevent you from living the lifestyle that you want. These physical therapy tips can help you stay flexible, strengthen your neck, improve your posture and prevent the aching from coming back. What Causes Pain In the Cervical Spine? Your cervical spine houses all of the nerves that send communication between your brain and your body. 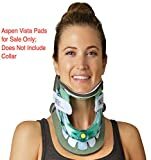 It also supports your head and neck and moves in almost every direction. This part of the body is intricately constructed and surprisingly strong and flexible. Daily repetitive activities or traumatic injury can damage the complex elements in this region and result in pain. If any of the joints are damaged or develop wear and tear from years of activity, they might feel stiff and achy. The discs that cushion between the vertebrae degenerate over time, which could leave you with pain. If the nerves that branch off the spinal cord are pinched or irritated by misaligned vertebrae, you may even feel symptoms down your arms or in your upper back or shoulders. According to SPINE-health, most pain in the cervical spine can be treated without surgery and at home or under the direction of a medical professional. It is advisable to get a medical evaluation and ask your doctor before doing physical therapy for chronic neck pain on your own. If it’s safe, you might want to use these physical therapy tips to help alleviate aches and stiffness. 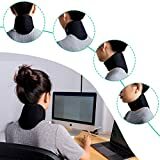 Many people aren’t sure whether they are supposed to apply cold or warm compresses when their necks hurt. Using ice when the pain starts is often preferable. If you experienced even a minor injury, you might be dealing with inflammation. Ice help to reduce swelling in the area. It also numbs you, allowing you to feel like you have more mobility. Be careful if you use cold packs to relieve pain. While you’re numb, you might feel like you have an extended range of motion. However, you still need to rest your head and neck to allow yourself to heal. When you use ice, make sure to wrap it in a towel so that you don’t damage your skin. Leave it on for about 20 minutes, and give yourself a 40-minute break before applying it again. Heat can make swelling worse, especially when you have acute pain. After a few days of applying cold compresses, you can alternate using ice with heat if the warmth feels relaxing. WebMD explains that the general recommendation is to use ice for up to 48 hours after you first feel pain. After that, heat can loosen your muscles and make them feel less stiff. You should protect your skin when using a heating pack so that you don’t get burned. Heat may also be applied for 20 minutes at a time with 40-minute breaks. You might not be able to move your neck much during the acute phase of pain. However, your doctor or physical therapist may recommend that you begin to establish mobility at a certain point so that you don’t remain stiff. These exercises should be performed when your muscles are warm. Try taking a warm shower or applying a heating pad before stretching your neck. Slowly turn your head so that you’re looking to the left. Hold it there for about 30 seconds. Then, move your head gradually back to the center. Repeat on the other side. Again turn your head to look over your shoulder. Now slightly lower your chin to deepen the stretch for 30 seconds. Return to the center, and then repeat this on the other side. Again turn your head to one side and lower your chin. Now slightly lower your opposite shoulder to deepen the stretch and hold for 30 seconds. Return to the center, and then repeat this on the other side. Watch a video to see how to perform these stretches correctly. Tilt your head forward as though you are trying to rest your chin on your chest. Focus on keeping your shoulders down and relaxed as you do this. Let the weight of your head draw the neck down. Hold for 30 seconds. Stand facing a corner. Place your hands on each wall. Slowly lean into the corner, squeezing your shoulder blades and breathing. Hold for 15 seconds, and then relax back to the starting position. Slouching is a primary cause of neck pain. Many people slump their shoulders and jut their heads out, putting extra pressure on their cervical spine. Small lifestyle changes can help you maintain a better posture. Place your computer monitor on a riser so that you don’t have to bend over or tilt your head down to view it. Keep your back against your chair instead of pulling your body toward the computer screen. Also, make sure to get up frequently. The longer you sit, the more your postural muscles will fatigue and result in poor posture. Unfortunately, many of us use mobile devices instead of computer monitors nowadays. This keeps us hunched forward over our phones and tablets. Your body gets used to this position, and correct posture can feel abnormal. Holding your phone up to eye level while using it can help prevent what some refer to as “text neck.” Take frequent breaks. Once every hour, rotate your neck by looking gently to each side ten times before going back to your device. When lifting objects, don’t bend forward using your back and neck. Instead, keep your upper body straight. Bend your knees, using the power in your thighs to support the heavy load. Also tuck your chin slightly as though you are nodding your head down. This activates a spinal cord reflex to tighten the muscles in the neck, which then naturally act as a brace to help protect you neck. Maintain this chin tuck while lifting. If you want to optimize your mobility and eliminate neck pain, you should stay active, keep your muscles balanced and avoid positions that exacerbate poor posture. These physical therapy tips can help with chronic neck issues so that you can feel great no matter what you’re doing.